NEW! Economy option and HTP expression in 24-well plate format now available! High throughput (HTP) gene antibody production provides the most cost effective option for small-scale full-length recombinant antibodies, where you may choose either supernatant or purified antibodies (ug to mg level). From customer-supplied antibody sequences to final deliverables, HTP antibody production projects take as short as 18 business days (standard packages)! There is no additional set-up fee, and the cost of gene synthesis is waived. This popular service combines GenScript's expertise in high-throughput gene synthesis with a proprietary transient antibody expression technology to produce high quality recombinant antibodies for both therapeutic antibody drug candidates and reagent antibodies. Examples of antibody sequences accepted: variable region sequenced from hybridoma, hits (Fab or scFv) selected from display library based method, sequences from single B cell and/or repertoire analysis via next generation sequencing (NGS), and many more. Multiple formats (Fc.fusion fragments) for expression; Flexible optional QCs. Now available in 24-well expression format! New! One-stop solution: From gene synthesis to purified recombinant antibody. An Economy option is available! New! Project can begin from HTP gene synthesis or customer-supplied DNA but Antibody sequences are required for project evaluation in both cases. Turnaround time does NOT include shipping details. Please add approximately 3-5 days to account for shipping onto the dates listed. Pricing applicable to human IgG1, human IgG4, and mouse IgG2 a/b; Kappa (ĸ)/lambda(Λ) light chains. QC Data for SC1946 includes Western blotting against the Fc tag of the antibody to determine expression. QC Data for SC1796 & SC1797 includes A280 for Antibody concentration and SDS-PAGE for purity assessment. Additional QC such as SEC-HPLC, HTP ELISA, Endotoxin Testing, LC-MS, and peptide mapping available upon request (pricing may vary). QC Data for SC1946E includes Western blotting against the Fc tag of the antibody to determine expression. QC Data for SC1796E & SC1797E includes A280 for Antibody concentration and SDS-PAGE for purity assessment. 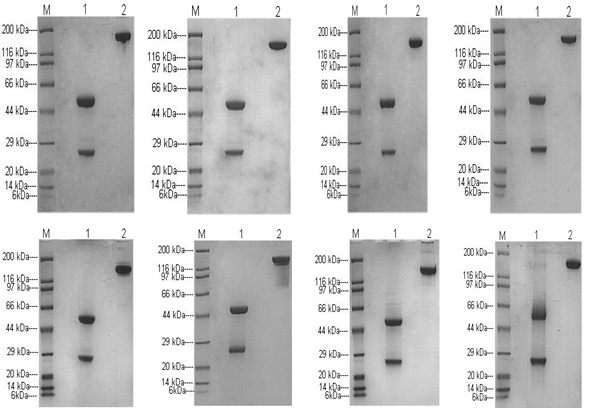 QC Data for SC1973 and SC1973E includes Western blotting against the Fc tag of the antibody to determine expression, and SDS-PAGE for purity assessment. This popular HTP gene to antibody service is designed to help researchers scale quickly from promising leads to purified recombinant antibodies in a microscale format, to accelerate their preliminary drug screening process. Applications served include epitope binning, ligand competition binding studies, affinity measurements, primary and secondary screen assays, HTP biophysical characterization to assess developability, and more. Promising leads from your HTP studies can be seamlessly integrated into the GenScript workflow for scale up transient recombinant antibody production or stable cell pool/cell line production, for milligram to gram-level expression, which can support all your in vitro and in vivo applications. Need more antibodies 5mg to 30 mg range? Check out MamPilot™ guaranteed antibody expression package, get your purified antibodies just in 4 weeks. Still unsure? Use this service guide to determine which is the best match for your application. For more information about any other protein services, please visit our recombinant protein services main page or contact us using the information listed below.